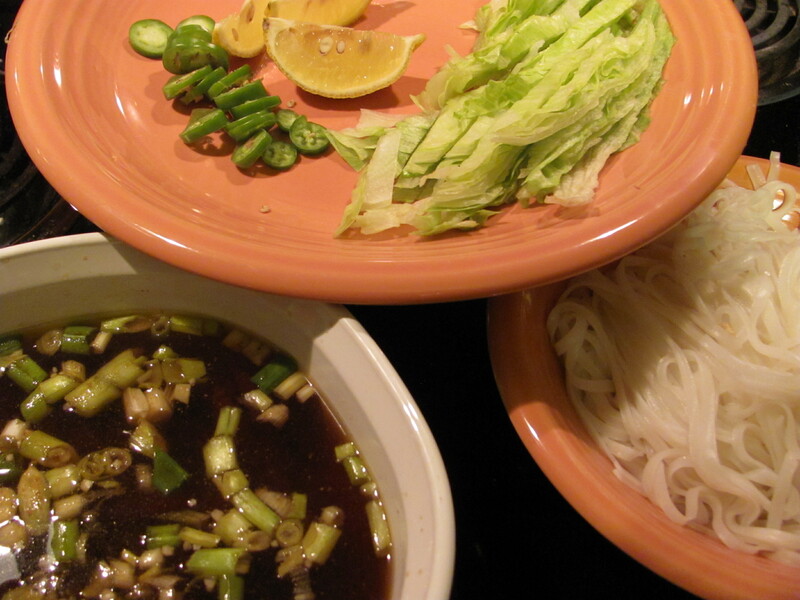 flat rice noodles–they can be any kind of Asian rice noodles. some kind of thinly sliced, cooked beef. It can be anything. (I’m saving the rat jokes for the Cornish Pasties, thank you very much.) In this instance I used a “Bargain Meat” -stickered, thinly sliced Milanesa steak that appeared in my refrigerator, lightly seared, after I’d waited too long to use it in said Cornish Pasties. Directions: Put the rice noodles in the microwave safe casserole or bowl. Cover with water. Set the microwave to run on “high” for eight minutes. Go do something more interesting–like inventory the refrigerator or go pay your way overdue condominium dues. Anyway, when you come back after about fifteen minutes, chop the scallions finely to stall for time on taking a too hot dish out of the microwave. Then, take the rice noodles out of the microwave and remove them from the cooking water, carefully. Set the noodles aside in a bowl. Slice your beef finely and add it to the same dish. Add the beef broth, fish sauce, garlic, coriander, four cardomom pods, scallions and a small piece of peeled fresh ginger to the microwave safe dish. Put the meat and spice broth back into the microwave and set in on fifty percent power for six minutes. Meanwhile, finely slice the iceberg lettuce, jalapenos and lemons or limes. When you’re done slicing, take the broth out of the microwave. Ladle the broth and noodles into bowls, garnishing them with the lettuce, lemons and, possibly, jalapeno. Serves about 6 for about $1.00 a serving. Note about the rice noodles: They should say, “gluten-free,” or be from Pacific Rim countries like Thailand–it’s too hot to grow wheat in Thailand, so Thai rice noodles are milled in places that have never used wheat.